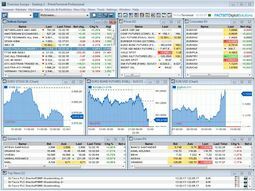 PrimeTerminal is FactSet Digital Solutions' customizable financial terminal. It can be tailored specifically for investment, advisory- and sales processes in private banking, commercial banking and asset management. Because the data can be permissioned and billed by the individual user, PrimeTerminal allows for flexible and targeted usage. PrimeTerminal offers the complete range of FactSet Digital Solutions' content universe. The user may tailor his user interface according to his individual information requirements and workflows. Client proprietary content such as in-house research can be seamlessly integrated for a one-stop solution. PrimeTerminal can also be linked to in-house applications like content management or customer relationship management systems. and fundamental and research data clips appropriate to the displayed content. Streaming and historic data may be exported and integrated into Microsoft ® Office Excel for further analysis via DDE or XLPort. Individual screens can be saved and shared among users. PrimeTerminal is fully customizable in terms of dynamic adaption to content requirements, application behaviour, fonts, colours and offers multi language support.